Present: Lee ZL2AL, Revell ZL2SS, Peter ZL2CD, Wally ZL2MO, Bert ZL2OC, Mike ZL2MY, Erroll ZL2IT, Stan ZL2ST, Jan ZL2CZE and Karl ZL1TJ. Minutes of the previous meeting: read and confirmed correct: ZL2OC, ZL2TC. 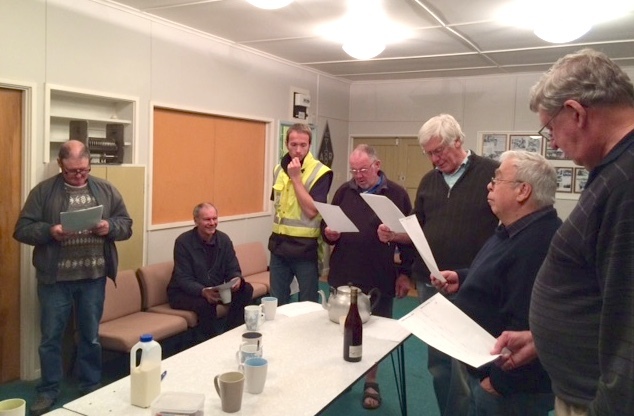 From Keep Napier Beautifull, a cheque for $500 to assist with the exterior upgrade of the clubrooms, from Dave ZL2DW a reminder that Branch 25 members will be welcome at this month’s branch 13 Meal and Meeting to be held at Waipukerau. Also that this years Christmas dinner will be on November 21 at the Taradale RSA Club. Outwards: a letter of thanks to Maxine Boag of Keep Napier Beautiful and a letter to the CEO of the Napier City Council enquiring if the council’s resources might be available to assist with the planned exterior re-paint. No significant transactions to report. Laurie reported on a proposal from Branch 13 to install, at apropriate locations, signs informing visitors to the district of the local repeater frequencies. Visiting radio amateurs would be reminded to make their presence known and be made to feel welcome by a local ham responding. The idea was thought to be excellent and worthy of further investigation. Wally reported on the ongoing improvements to the building, the operating room is now completed and polycarbonate window panels have been ordered. conducting his fourth Annual Quiz, questions mostly on ham radio and electronics but also including some general knowledge (did you know a ‘Twit’ is a pregnant goldfish?) Don’t think anyone got that one right! And on average the human heart beats about 60,000 times a day, amazing it lasts as long as it does! The highest score of 24 (out of 30) correct answers was Lauries’ who (once again) took home the prize (a bottle of Pinot Noir wine). Three or four contestants managed 21 out of 30 correct answers. It was a good quiz, not too hard and not too easy. Laurie brought the customary buns and the evening ended on a high note.